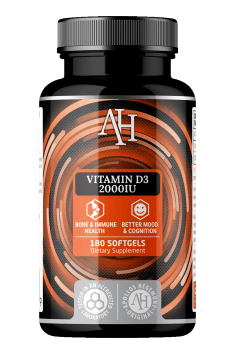 Apollo's Hegemony Vitamin D3 is a dietary supplement containing vitamin D3 in the amount of 2000 IU per capsule. Unlike most preparations available on the market, the product is suitable for vegans and vegetarians because it contains vitamin D3 of non-animal origin. Vitamin D3 (cholecalciferol) is, alongside vitamin D2, the main precursor to vitamin D. The relevant, biologically active compound, also called a vitamin-hormone, is calcitriol formed from vitamin D3 in the kidneys (1α, 25(OH)2 D3). Vitamin D plays important, multi-directional functions in the body. Its optimal level is important for maintaining optimal health. The body is capable of skin synthesis of vitamin D, provided that a large surface of the skin is exposed to the sun for quite a considerable time, which is usually difficult to achieve. Available meta-analyzes indicate the superiority of vitamin D3 over vitamin D2 – vitamin D3 more efficiently increases the level of the active metabolite in the body. Vitamin D3 can be found only in animal products – including in fish oil, butter or eggs. In turn, vitamin D2 is found in plant products, however, in small quantities and only in a very limited number of products. Hence vegans are a group that is particularly vulnerable to deficiencies of this important vitamin. Supplementation comes to help. Due to the fact that cholecalciferol is most often obtained from lanolin, most of the available preparation with vitamin D3 will not be suitable for vegans. However, thanks to the use of vitamin D3, not from a non-animal source, Apollo's Hegemony Vitamin D3 is an ideal solution for vegans. Normal bone mineralization depends on the presence of vitamin D. It is responsible for the proper calcium and phosphate metabolism, ensuring the proper absorption of calcium and phosphorus. Vitamin D regulates bone tissue metabolism and influences the balance between bone formation and bone resorption. Therefore, vitamin D is essential for the proper structure and functioning of bone tissue. Vitamin D receptors are present in many tissues and organs of the body, including the central and peripheral nervous system. It is believed that vitamin D has neuroprotective effects. It proves to be beneficial in mild cognitive disorders, and its low level is conducive to an increased frequency of these disorders and Alzheimer's disease. There are multitude health consequences of vitamin D deficiency – mainly disorders of bone metabolism, as well as an increase in the incidence of certain cancers (including colon and breast cancer), depression, cardiovascular diseases (hypertension, metabolic syndrome). Vitamin D, as a regulator of the immune response, affects the level of proinflammatory cytokines IL-4 and IL-10. Therefore, vitamin D deficiency increases the risk of developing autoimmune diseases. In conclusion, Apollo's Hegemony Vitamin D3 is a dietary supplement, aimed at supplementing vitamin D deficiencies. The product is recommended for long-term supplementation as a pro-health prophylaxis, especially in case of insufficient body exposure to sunlight, during periods of tiredness, weakness, mood deterioration, the discomfort of the motor system. Vitamin D3 2000IU 180 caps. Due to the fact that vitamin D3 is fat-soluble, it is best to take the preparation with a fat-rich meal. When supplementing with vitamin D3, you should remember about an appropriate diet containing calcium sources. Vitamin D3 will enable optimal assimilation and use of this important macroelement. Dietary supplement of an extract of garlic bulbs. It protects the heart and circulatory system, kills bacteria.